After the overwhelming success of the Magellano 50 preview - with thousands of downloads in just a few months - the Azimut Yacht virtual showroom adds three flagship models for the 2012 boating season: Azimut 45, Azimut 60 and Azimut 62S Italia. Taking full advantage of Apple technology, boat owners, enthusiasts, and curious individuals can tour the new yachts introduced at the most recent boat shows. They can find out about the boats’ most important features and technical specifications and compare the different layout options. Most of all, they can appreciate all the design, comfort, and technological benefits which have always characterised Azimut Yachts over the years, and which here find their ultimate expression. All you have to do is enter this new dimension to discover the secrets of the world’s most fascinating yachts, the epitome of style and Made in Italy quality. Azimut Group presents an open Weekend in the Marina di Varazze on the 14th and 15th April, 2012. On that occasion Azimut Group clients will have the chance to see and try both the Azimut and the Atlantis Yachts. Sea trial reservations or visits have to be booked in advanced by sending your request directly to the dealer of your area. A well-crafted sales and service exclusive agreement with Marina Estrella, the leading distributor in Spain. Azimut Yachts has recently entered into an important partnership with Marina Estrella, the Spain’s leading boat distributor. The agreement underscores the strategic importance of the Iberian market, one which has for years welcomed boat owners from all over Europe. With 20 sales and service centres and more than 30 years experience in marketing the world’s major boating brands, Marina Estrella is Spain’s largest pleasure-boat distributor.The agreement further confirms Azimut Yachts’ lead role as a worldwide ambassador of Made in Italy quality and design. Azimut Yachts and the Spanish dealer Marina Estrella - founded in 1972 by Jose Estrella – both share the passion and commitment of an entire family, who believes in the power of human resourcefulness. Through its Azimut yacht sales and service activities, Marina Estrella joins the ranks of existing dealers Hermanos Berga and Marina Marbella, already well-established resources for Azimut Yachts customers in Spain. In this way, with already over 25 sales and service centres throughout the Iberian region, the capacity to service the Azimut brand continues to grow. Baglietto, historical shipyard based in La Spezia, announces a new management that run the yard towards the recovery plan which will lead the famous “Seagull” brand again into the yachting hall of fame. 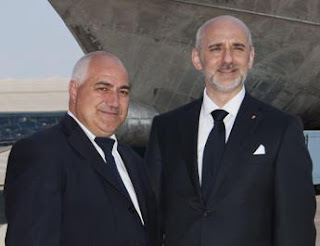 Since 1st February 2012 Diego Michele Deprati established himself as the new Mananging Director of Baglietto shipyard; close to him as Production Director, Angelo Giaccone. They will be in charge of the tough and challenging goal to restore the glorious past of the iconic Italian brand Baglietto. Diego Michele Deprati can boast a notable curriculum vitae: born in 1963, a phd in engineering, after covering power roles in the Italian Navy he worked for more than 20 years in the Mondo group covering many different important roles and in 2001 he was appointed as Managing Director (directly looking after the sales as well) of Mondo Marine shipyard. Together with him, since the very beginning of this adventure, Angelo Giaccone, 49 years old, a background in the world industry and more than 20 years of experience as Production Director. A new challenge that both of them took over with enthusiasm and passion. After so many years spent together and so many experience shared, this well-established team bases itself on three major words: firmness, seriousness and capacity. The new Australian owned-and-designed luxury marque, Belize Motoryachts will make its world boat show debut at the 2012 Sanctuary Cove International Boat Show with the world release of the new Belize 52 Hardtop. Belize Motoryachts co-founder and Riviera CEO Wes Moxey said the new Belize 52 would be on show at the Riviera display located on F Arm. The limited-edition, semi-custom Belize 52 is an elegant 52’10” (16.10 metre) cruiser, engineered with perfection for the boating aficionado who not only appreciates tradition and timeless style (the Belize draws its aesthetic inspiration from the classic European timber-based boats of the Art Deco era), but also the quality assurance that comes inherently with the bespoke craftsmanship process and the latest technology. Created in two variations (single-level, sports yacht-style Hardtop, and split-level Day Bridge), the svelte and stately Belize 52 has a limited production output of just nine boats in the next twelve months growing to a maximum output of 30 per year by 2015. The luxury-positioned Belize, named after the inspiring Caribbean boating destination, is expected to appeal to a different segment of the luxury boating market – enthusiasts that have owned various other boats from production to traditional. Even sailboat owners that now want to move into power boating for all of its convenience, but want something different and bespoke to reflect their individual tastes, as well as the latest modern technology have expressed an interest. The Bertram-Hatteras Shootout, the heralded 32-year running fishing tournament managed by Bertram Yacht, Hatteras Yacht, Allied Marine and Marine Max, has been collectively reorganized to be held in 2013 as a biannual fishing tournament by the sponsoring Shootout committee. The deep heritage of the invitational Bertram-Hatteras Shootout will remain embedded in the core of the tournament and like most quality events, relished in tradition and history, the Bertram- Hatteras Shootout will be held once every other year and become a more diversified tournament. The 2012 edition of “Convergence” ended on 16th March. “Convergence” is the training and refresher Master Course that the Ferretti Group - a world leader in the construction of luxury motor yachts with a unique portfolio of the most prestigious and exclusive brands in the nautical world - devotes every year to the Captains and Chief Engineers of its boats and vessels. The eighth edition of this meeting was held in the beautiful setting of Lake Garda, and included a far-reaching programme extending over four days and focusing in particular on onboard safety and the management of emergencies, as well as on the importance of having a thorough knowledge of the craft and its technologies. The technical sessions, organised in cooperation with the Ferretti Group’s leading Technology Partners, dealt with a wide range of subjects and were eagerly followed by over 120 participants. The lectures held by MTU, ZF, Onan, Rina, Condaria, Flir, Gianneschi, Idromar and Naviop were particularly appreciated by the attendees; their main goal was to illustrate the state-of-the-art in the technologically innovative systems installed on the Ferretti Group's yachts, as well as to explain how a close cooperation between the Partners and the Group from the very early stages of product development can result both in top-quality products and in easier management and maintenance by onboard personnel. Besides theoretical sessions, technical-training demonstrations were also held in the various dedicated corners set up by the Partners Fluiten, OceanLed and Rolla, while during the dinner on Wednesday night Flir made an unusual night demonstration of their thermal imaging cameras. On the same occasion, all participants could taste and enjoy the wines of Consorzio Tutela del Bardolino, Jack Daniel's spirits and Davidoff's cigars.The training was further enriched by the visits to some historical nautical companies located on Lake Iseo, particularly the legendary Cantieri Riva and Cantieri RAM, in Sarnico, as well as a visit to Besenzoni and to the boatyard and showroom of Nautica Casarola in Peschiera del Garda, where - on the last day of the Convergence meeting - the certificates of attendance were handed over to all participants. Two themes that are closely related to the recent events that occurred in Italy, the management of onboard emergencies and safety, were at the core of the opening lecture held by the RINA, devoted to life-saving appliances and ship abandonment procedures. The Captains and Chief Engineers also took part in a team building video-shooting activity which inspired some in-depth reflection and a very interesting debate during the round table chaired by Eng. Roberto Martinoli, one of the leading experts in this field, the Italian delegate of the European Cruise Council and the Managing Director of Grandi Navi Veloci. “Convergence” is thus confirming, year after year, it is an unmissable training opportunity and one of the most enthralling activities for the entire Ferretti Group, which constantly aims to strengthen a sense of belonging and closeness as well as to ensure that “its” sea professionals are always in the lead in terms of training and skills. Ferretti Custom Line, Ferretti Group brand operating within the production of fibreglass maxi-yachts measuring 26 to 38 metres, announces the launching of the Custom Line 112’ Next, a 34 metre vessel in the planing category and the twenty-eighth model of the 112 inch models. The launching ceremony, strictly organized in private, was held at the shipyard of the Group in Ancona with a traditional baptism during which a bottle of champagne was shattered on the keel: 21st March, a special day for the launching of the maxi yacht, marks the official opening of the 2012 boating season. Present at the launching, together with the senior management, amongst whom was Lamberto Tacoli, Chief Sales & Marketing Officer of the Ferretti Group, were the ship owners of the new 112’Next: the Chinese society of the real estate Xanadu South China Sea. In fact, the 112’ NEXT will have a specific use, it will be one of the attractions at the avail of the guests of the luxurious real estate and tourist complex of Xanadu South China Sea, which is being built on the island of Hainan, and it will also be one of the biggest maxi yachts, manufactured in a European shipyard,to sail in Chinese waters. The boat will therefore have a leading role in guaranteeing added value to a structure that will be one of the most important resorts of the South of China, consisting of a 5 star hotel, many beautiful villas, a spa, a conference centre, a helicopter landing pad and a private yacht marina. The island of Hainan, with its lush unpolluted nature, is considered to be the best tourist destination for the new elite of the land of the rising sun. Fipa Group shipyards are using these times of uncertainty to their advantage by investing in technological progress and innovation thereby openly declaring their continuous dedication to a modern society which is in constant evolution. The respect for the environment (the company is certified UNI EN ISO 14001:2004) and reduction in energy consumption are necessities which are felt even more strongly in the current key period and they have encouraged the Group to look for innovative solutions to reduce the environmental impact of its constructions. At first, attention was turned towards interior outfitting: natural materials were introduced for furnishings and upholstery and their use was then further extended to insulation purposes. Furthermore, innovative solutions were also sought for the propulsion with the objective of reducing consumptions in respect of the environment while considerably increasing efficiency and comfort on board. In light of that, the Group has been studying and developing models with hybrid propulsion, a new line for the venerable MAIORA brand which will revolutionize life on sea with propulsion packages making use of the very latest and most advanced technologies. Care for the environment - reduction in consumption of up to 20% - reduction of the environmental impact - are absolute imperatives of our modern society in which Fipa Group remains firmly rooted. Jarrett Bay Boatworks, one of the mid-Atlantic's largest full-service marine facilities, has expanded their offerings with the recently signed Volvo Penta Authorized Dealer agreement. Vessels of all classes transiting the waters between Wanchese & Wilmington, North Carolina may now look to one of boating's most respected operations for sales and service of Volvo Penta's state-of-the-art power systems. A range of new brochures has just been published showcasing the various Mulder Shipyard models available. You can download them as a .pdf file on the Mulder web site in the following languages; Dutch, English, and Russian of your choice. Four seperate brochures have been made for each of the Mulder series style of yachts and cruisers; Convertible, Favorite, Flybridge, and Wheelhouse. Construction of our new yard in Zoeterwoude Rijndijk is well underway. All the deep foundations have been embedded into the ground and the contractor has started laying the concrete floors of the dry dock. The yard will be ready for use by the end of this year. This state-of-the-art facility will cover an area of 7000 square metres and be focused on the maintenance, refit and new build of yachts between 18 and 40 metres. Our current yard in Voorschoten will be used for maintenance activities and the construction of smaller boats. This state-of-the-art facility will cover an area of 7000 square metres and be focused on the maintenance, refit and new build of yachts between 18 and 40 metres. Our current yard in Voorschoten will be used for maintenance activities and the construction of smaller boats. In the new yard Mulder Shipyard will also offer you even more refit options. At Mulder we see every refit as a matter of teamwork. Our designers, engineers and craftsmen will partner with you to ensure that your yacht entirely reflects your personal style and needs. Whether it involves a new paint job, upgraded technical systems, a new propulsion system, the latest navigation equipment or new interior woodwork, a first-class finish and result is assured using the very latest techniques and finest materials. The wide range of yachts built and refitted by Mulder over the decades are a testimony to our adaptability and inventiveness. The two new dry docks will offer everything required for yachts of up to 45 metres. Contact us to discuss the options for creating something very special together. You can also visit us in our refit stand at the METS exhibition later this year. Nordhavn enjoyed one of its busiest shows in years at last month’s Miami Yacht & Brokerage Show. 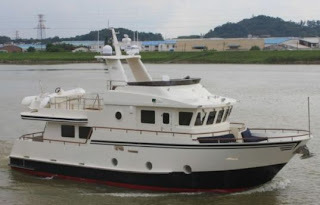 Nordhavn 64 Sweetwater provided an excellent example of Nordhavn quality and craftsmanship. On February 17th, the company hosted its annual Miami show Nordhavn Owners gathering. About 50 current owners, some past owners and even some prospective owners assembled at the Nordhavn display for some beverages, conversation and camaraderie. Topics trending within the crowd were discussions of possible owner-organized rendezvous: one, a summer gathering in Nova Scotia; the other, a 2013 winter/spring get-together in the Bahamas. Typical Nordhavn fare! Overmaine new facility which represents a fundamental step in the growth of Group has almost been completed. Located in the area of the Darsena Pisana (Pisa wet dock) on a total surface area of 22,000m², it counts four buildings making a total internal surface area of 9,000m² which are 20 metres in height. Huge spaces, suited to building and fitting out yachts measuring 60 metres and over, are perfectly equipped with bridge cranes, aerial work platforms, suction systems and well-equipped metal carpentry and joinery departments. Split into different work areas, this is the ideal environment for a cutting-edge structure. All the Overmarine Group needed was premises that were spacious enough to enable it to launch itself on the mega-yacht market. The know-how and professionalism that have always characterised the Group will immediately be put to good use at the shipyard, giving shape to the new icon of the Group and luxury pleasure boating: the innovative Mangusta 205. This will be followed by the construction of other custom-built aluminium and steel mega-yachts, new Mega-Open yachts to complete the Maxi Open range (from 72’ to 165’), and the displacement yacht Flying Bridge Mangusta Oceano 148. Inauguration of the facility has been planned for June 2012. Princess Yachts International plc is delighted to announce the creation of ‘Princess Yachts South East Asia’, incorporating a new partnership led by Princess Yachts Thailand, part of the Phuket Boat Lagoon Group of companies. Princess Yachts South East Asia will amalgamate Boat Lagoon Yachting with offices in Malaysia led by Ms Shi Lin Oh and Mr Oh Kean Shen; operations in Singapore with Mr Alan Pickering; and sales and service facilities in Indonesia with Mr Kris Pramono. Fluid Motion has announced a transition in the representation of its Ranger Tugs dealership in the Chesapeake region which will provide many benefits to the area's trailerable yacht enthusiasts. Mark and Tony Schulstad, owners of Mass Enterprises and Cutwater Marine Sales have acquired Chesapeake Ranger Tugs formerly owned by Chuck Wistar. Cutwater Marine Sales is part of a yacht dealership based in Grasonville, MD, and Mark will retain the Chesapeake Ranger Tugs office in Annapolis, MD. Both locations will give customers access to Ranger Tug and Cutwater Yacht models. In addition to keeping the Annapolis office operational, Chuck Wistar will remain part of the organization in a sales, marketing and strategic planning role. His years as a Ranger Tug dealer in the Chesapeake region have resulted in a rapid expansion of owners in the Bay area and he will continue to serve Ranger Tug owners and prospects as well as Cutwater customers. The existing Cutwater Marine Sales team includes two dedicated sales associates as well as a service team headed by Tony Schulstad and is responsible for servicing, warranty work, electronics installations and maintenance and outfitting. The management of both companies under Mass Enterprises, LLC provides owners access to all these services out of the Grasonville location. As a joint business, Cutwater Marine Sales and Chesapeake Ranger Tugs will be responsible for sales and service for owners in the entire Chesapeake Bay region including the Baltimore/Washington, DC Metro area, Annapolis and the Delmarva peninsula. Ferretti Group’s Iconic Riva brand was present during the prestigious Saks Men’s Authentic Luxury Weekend on March 23 till 25, 2012. The weekend highlighted artisans from all the top men’s vendors around the world including Riva to showcase the elegance and craftsmanship’s of their brands. Riva had an exquisite booth tailored specifically for this event showcasing the elegance and craftsmanship of this iconic and timeless brand along with a private showcase of Riva’s newest yacht creations in the Saks Men VIP lounge on the 6th floor. Riva product Manager for North America Giuseppe Meneghetti was also available for questions. Riviera, Australia’s largest and most awarded luxury boat builder officially announced this afternoon to the company’s staff and contractors that a sale transaction had been completed earlier in the day. This sale will allow Riviera to officially exit receivership and move positively forward under private ownership. Longhurst Marine Holdings Pty Ltd, a Queensland based investment company has purchased the Riviera assets, work in progress and associated companies for an undisclosed amount. Longhurst Marine Holdings has offered employment to the majority of Riviera staff and contractors and has also entered into a long-term lease for Riviera’s 14-hectare state-of the-art Coomera manufacturing facility. Rodney Longhurst, the Managing Director of Longhurst Marine Holdings is well known in Queensland business circles having developed an investment portfolio in tourism and property. Mr Longhurst already has a significant investment in the boating industry in the 9.2-hectare marine service facility “The Boat Works” located on the Coomera River within the Gold Coast Marine Precinct. Mr Longhurst said the inherent strength of Riviera in the face of recent global market forces was the key factor that drew his interest in acquiring the business. Free of Receivership constraints, Riviera will now move through a restructure and recapitalisation process to prepare the company for future growth opportunities. Part of this process will be the creation of a new senior management team to drive the business forward. Wes Moxey, the former CEO of Riviera and a veteran of 26 years with the company has been asked to return immediately as CEO. After taking a 12-month sabbatical from the boating industry, Mr Moxey has spent the past 18 months immersed in the development of a new line of limited edition Motoryachts called Belize. The Belize Motoryacht line will shortly be offered through the Riviera global dealer network of 46 dealers’ spaning 66 countries. Stephen Milne has been Riviera’s Director of Brand and Communications for the past nine years. Prior to his full time employment in 2004, Mr Milne was a contractor in marketing services for many years to Riviera. Mr Milne has been appointed as Director of Brand and Sales. Chris Gilfoyle who has enjoyed a 20-year career with Riviera on the production side of the business has been appointed as Head of Manufacturing. Riviera, Australia’s largest and most awarded luxury boat builder has recorded its best sales results in six months both domestically and internationally with the contracting of 12 new boat sales totalling AUD$13.9 million for the month of February. Riviera’s director of brand and communications Stephen Milne said this was a tremendous result and proof the luxury boat market was gaining confidence and momentum in both Australia and the United Sates. Riviera’s brand strength and superior design and build quality continues to defy industry sales trends. The boats sold in February are destined for owners in Australia, the US and Latin America. The models sold in February were two 4400 Sport Yacht Series IIs, one 47 Enclosed Flybridge, one 43 Open Flybridge, five 5000 Sport Yachts, two 63 Enclosed Flybridges and two 53 Enclosed Flybridges. Riviera is now preparing for the Sanctuary Cove International Boat Show and the inaugural Riviera Festival from May 24 to 27 to be held at the company’s Coomera manufacturing facility. The new 75 Enclosed Flybridge will make her world debut at the Riviera Festival where a full line-up of 16 individual models valued at AUD$23 million will also be on display. The Festival will also include a Premium Brokerage Showcase featuring a wide range of selected pre-loved Riviera models. Riviera, Australia’s largest and most awarded luxury boat builder will showcase its most popular models at the 24th annual Sanctuary Cove International Boat Show, which will be held from May 24-27. Included in the Riviera line up at this year’s show will be the stunning 5800 Sport Yacht which has sold 23 boats to date, the 5000 Sport Yacht which has sold 46 boats and the 43 Open Flybridge which has sold 35 boats since its world release at the 2010 Sanctuary Cove International Boat Show. As one of the shows founding exhibitors, Riviera enjoys a 24 year history at Sanctuary Cove and will be in their familiar location at the beginning of F Marina. Riviera’s director of brand and sales Stephen Milne said the multi-award winning company was anticipating another successful boat show following the encouraging results in Miami, USA. The Riviera display will also feature some of the latest marine navigation and desalination equipment from R Electronics. Managing director Errol Cain has supervised the installation of marine electronic systems into thousands of luxury cruisers in his 24 years experience and looks forward to the Sanctuary Cove International Boat Show. R Electronics will have an experienced technician at the display to assist with all electronics and systems enquiries. The Riviera Syndication team will be on board their Riviera 5800 Sport Yacht which has limited shares remaining in boats located in Sydney, Sanctuary Cove and Hamilton Island. Riviera Syndication managing director John Russell said the 5800 Sport Yacht had been their most successful model in the past two years. Two Sunreef luxury catamarans have been shortlisted for the 2012 edition of the International Yacht and Aviation Awards organized by the UK-based design magazine, Design et al. The popular 70 Sunreef Power has been nominated in the Best Power Yacht up to 40 meters category, and the famous superyacht Sunreef 114 CHE has been selected for the Best Yacht Interior Design category. The online voting process is open now. Around 2,000 spectators gathered to watch the grand opening ceremony of the Twin Sails Bridge, on Friday the 9th of March 2012. A flotilla of stunning boats passed through the bridge, including a Sunseeker Predator 84, to commemorate the official opening of the new bridge. Evening entertainment was provided for the crowds, including a musical accompaniment from the Bournemouth Symphony Orchestra and Her Majesty's Royal Marines Collingwood band. Live music and street entertainment commenced later in the evening on the quayside, culminating in a grand finale fireworks display, which brought the celebrations to an end well into the night. The ceremony took place to mark the conclusion of a 40-year dream for a second Poole Harbour crossing. It was victorious day for Mark Donnelly and Dai Roberts.The Northern Irishman raced through the forests of Dorset and Hampshire with co-driver Dai Roberts to take the title on his Renault Clio R3 in a time of 1:07:06.0. Rallye Sunseeker, the largest Motorsport event in the south of England's sporting calendar, took place over the 24th and 25th of February 2012. Organised by Southern Car Club Ltd, Sunseeker was the official title sponsor for the 14th year running. The Rallye kicked off in the presence of the Mayor of Poole at Poole Quay on Friday the 24th of February, home to Sunseeker's headquarters and is said to have attracted over 8,000 spectators. Somerley Park, which was home to the Vale Motors Somerley Experience and Motorfair was blessed with sunshine on the race day which was held on the Saturday. Cars reached more than 100mph on fast stretches, and spectators were given the chance to get close to the action. Around 2,000 fans gathered by Bournemouth Pier to witness winners Mark Donnelly and Dai Roberts, who beat runners-up Desi Henry and Niall Burns in a Citroen DS3 by almost 2 minutes, take part in the traditional Champagne spray on the podium, attended by the Mayor of Bournemouth. Wider is a yachting company founded in 2010 by Tilli Antonelli. After its very well received debut at the Fort Lauderdale and Miami International Boat Shows, the company together with its North American distributor, Wider Yachts USA continuies its voyage through the States with the Palm Beach International Boat Show attendance on 22nd to 25th March, 2012. Ordered by a client Grand Banks has recently launched a brand new 53 Aleutian RP with a flag blue hull color. The above picture shows the entry level of the Aleutian fleet during a recent factory sea trial. This Grand Banks features the much appreciated Flag Blue hull, a gel coat color common among the many Eastbay yachts Grand Banks has built but new to the 53 Aleutian RP. Presented as a project in 2009, and launched in 2010 the 53 Aleutian RP has delivered to its upcoming expectations, and shown growing interest in the Grand Banks fleet, thanks to its hybrid looking lines of an explorer yacht, three double cabins layout, and choices for main and low decks layouts. Speed is up to 22 knots with twin 715hp Cummins engines. Cummins presented the new QSB6.7 at the latest 2012 Miami boat show. This new engine offers better performance, improved sociability, and improved operations over Cummins beloved QSB5.9 model, all without sacrificing fuel economy. The initial launch of the QSB6.7 will provide both commercial and recreational ratings from 380 up to 480 hp. The Cummins QSB6.7 provides more torque, which means better acceleration and maintained speed through turns. A pair of QSB5.9 480 hp engines installed in a pod-driven 44 feet express cruiser test boat accelerated the boat to 20 mph in 14 seconds, while the same boat powered by QSB6.7 480 hp engines accelerated to 20 mph in just 8 seconds, with little change to the legendary QSB fuel economy. The QSB6.7 also employs a new fuel calibration strategy: Unlike most marine engines, the QSB6.7 is calibrated for optimal fuel economy at cruising speeds, where the engine is most often used, rather than at wide-open throttle. The QSB6.7 is sociably improved, capable of meeting EPA Tier 3 emissions standards. This new engine offers exceptionally low cold-start smoke levels, and significant sound reduction at cruise and rated speeds compared to the QSB5.9. Operationally the QSB6.7 has improved with loads of new features. The standard fuel system is compatible with low lubricity fuels. With the use of Ultra Low Sulfur Diesel this engine offers extended oil change intervals, providing fewer oil changes and more time on the water. Another notable feature of the QSB6.7 is the PTO capability. The power steering and hydraulic pumps are gear driven, providing a substantial reliability improvement over belt-driven systems. For accessories that must be belt driven, such as a clutched Freon compressor, there is an additional belt driven PTO location above the seawater pump. Introduced in 2010 with the 31 Spirit Open, this Rodman range continues to grow and now features three models of which are two versions of the 31 and this new much awaited flagship. Designed by Fulvio De Simoni as the smaller 31, the Rodman 42 Spirit continues a bit its mix of appeal for modern looks with traditional concepts. See longer fore deck, or the very straight bow, not fully extended flybridge. Accommodation in the 42 Spirit Flybridge is not far fetched, considering it has Volvo IPS you get only two well spaced cabins, with an owners room to fore, and a galley located below to port side opposite the guest two single berths guest cabin. The main deck features a C-shaped lounge settee, opposite unit, and helm. The flybridge is more a sun preacher layout with an aft sunbed, and a medium sized L-shaped settee. Power is from twin Volvo 300hp engines with IPS pods which Rodman says should give a 30 knots performance, and a 25 of cruise. Viking shows up the project for a new 55 Convertible, what I imagine to be a replacement of the not so much selling 54. The new 55 is scheduled for launch coming Summer and will boast an interior designed by William Bales and Company. The interior is never the less traditional sport fish yacht with a comfortable single floor main deck, and three cabins below. The 55 Convertible offers one single options in both the deck from an island bar, or worktop up to the side bulk head by the galley on top, or a fore cabin with three berths, or an island more luxury double below. The owners room in the 55 is located to midships, starboard side, and features an en-suite bathroom. Another two single berths guest cabin is located to port side. 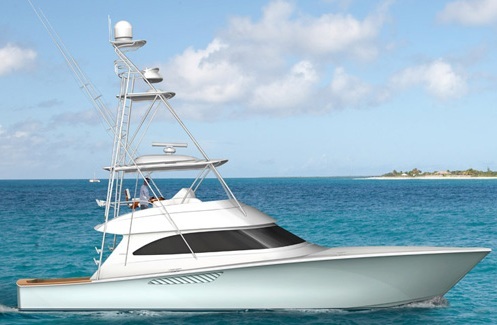 As other small or bigger Vikings the 55 is all but a fishing machine from the big aft deck, to the center console helm station on the flybridge. Fish boxes, freezer, tackle space, live bait storage are all found at aft, and this includes the much appreciated mezzanine aft looking settee. Power is from standard 1400hp MAN to optional 1550 again from the German engine manufacturer, or more powerful Cats 1625. Viking is predicting a wide open throttle 39 knots with MAN 1550hp engines. Tiara Yachts 3600 Coronet reflects the design, engineering and construction heritage of this quality known North American builder, with outstanding standard luxury features and optional equipment that make it a performing day boat and overnighter for four persons. The over sized split level cockpit provides great entertaining and socializing, with ample seating for ten, including a double-wide helm seat, curved companion lounge with Teak table, twin port and starboard aft-facing mezzanine seats, and a large aft transom lounge. An entertainment center with sink and drawer refrigerator, which can be equipped with optional electric grill and LCD TV is aft of the helm seat. Other optional equipment includes: Hardtop with sunroof, or canvas soft top, Teak table with sun pad filler for the transom lounge, and a beautiful exterior Teak accent package. This package includes Teak steering wheel, and inlay for the standard swim platform, Teak cockpit drink holders, toe rails, taffrails, companion L-lounge step treads, and deck wing handrails. Below deck, the 3600 Coronet offers a large comfortable retreat, featuring a Teak interior, with an optional Maple wood choice also available. The master stateroom includes a double pedestal berth, Teak tri-fold entry door, port/starboard hanging lockers and upper hull side cabinets, and wall-mounted flat screen LCD TV. The galley features a Corian countertop, stainless steel under mount sink, microwave, one-burner electric cook top, refrigerator, and cabinet storage. At the foot of the settee lounge is a floor mattress which when not in use, folds to give settee foot space. The head includes a counter top with integrated sink, mirror, storage, shower with glass door, Vacuflush toilet, and full frame wood door. The 3600 Coronet is powered with standard Mercury 375hp gas engines, or Cummins 380hp diesel choices. The Cummins apart standard shaft line propulsion can also be equipped with the ZF pod drives system. Of the well known British production builders, Sunseeker has since 1991 with the 60 Renegade always been the one pushing the envolope of always larger sizes. Sunseeker new flagship tri-deck 155 Yacht is now in build, and the first is due to launch in 2014. With a 4500 nautical mile range, this is the first ever semi-displacement, round bilge and long keel hull from the South England, Poole located Sunseeker. The 155 Yacht takes the concept of series building with personal customisation a step further than others, the modular composite build methodology virtually allowing owners a free hand, not just in the interior but also in the design of the actual superstructure. With a top speed of up to 26 knots the 155 Yacht will accommodate up to twelve guests and ten crew members. Elan presents a new option to its successful 42 model, and now gets added with a new IPS pod propulsion option, along with the easy to use joystick control feature. 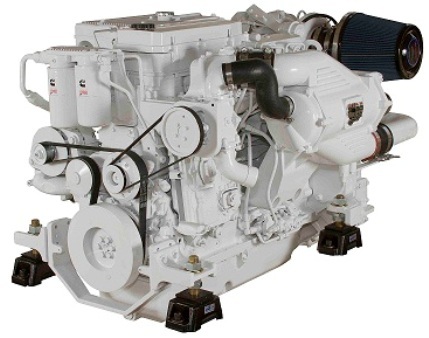 The 42 can now be equipped with the Volvo IPS500 370hp D6 engines, options. This version is also distinct and recognized also by its Black metallic hull feature, stainless steel port holes, and larger hydraulic moving up down bathing platform. For the remaining the 42 keeps the same element that has characterized its success of two or three cabins choices, and the good performing Tony Castro designed hull, who created the much appreciated super structure and interior of this renowned model. VZ shipyard from Venice, Italy is one of the small respected builders which grew its fame in the eighties, and nineties here thanks to the success of 18 model. An 18 meter motor yacht presented in 1993 and designed by Nuvolari Lenard, which was one of the design firms first and most successful jobs. Story is the 18 stayed in production for fifteen years replaced by the 64 in 2007. The VZ 58 is a development and replacement of the 2003 launched 16 later renamed 56 model. So far we can only show rendering for this model. New upper structure window present a more modern line, while the view windows in the middle suggest that the 58 might have a full beam cabin. Still though I want be so sure of that, as VZ has always been a yard which first looks at the bottom of its boats and then on accommodation. Semi customization has also been a selling point to VZ, and considering they build only from two to five boats a year they are a tailor made yacht. I have boarded a few 18 models and most had different layouts from three large cabins, to four or five room versions. The 16 was less a custom model, altough if you browse in brokerage sites you see differences mostly in wood choices between the versions. The Formentera series is a new range from Faeton, which with the F-36 presents a hybrid design of a high performance center console, and a cabin boat. A growing trend this one which started in Italy and has seen many builders in the European peninsula jump on this style of boat. The Faeton is one of the first of this hybrid center console cabin mash up to come out of Italy. Faeton Astondoa Group took more a performance route with a slim beam of just over three meters and a two step deep vee hull for its F-36 Formentera. Accommodation offers four berths in a Vee shaped convertible berth, door serpated cabin with two singles at midships, plus a galley, and shower head in between. 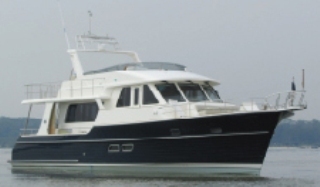 The exterior offers an L-shaped settee to aft, two seat center console, galley wet bar behind helm, and two step passageway to the foredeck in an all around deck. Engine wise the Faeton F-36 Formentera is more an outboard design boat with three engine choices starting from twin Mercury 200hp up to 300hp. In stern drive inboard choice the F-36 Formentera is offered with a single Mercruiser 320hp gas petrol choice. Being Faeton Spanish I am still surprised of no diesel engine option. We will see if this will happen in the near future. Marquis shows the rendering of an upcoming new 560 model. This project is not entirely new as it is more a fine tuning of the 56 model; with new hull window port hole shapes, modified more curved radar arch, stylish hard top choice for the flybridge, and more extended in length aft bathing platform with up down movement. Down below is a layout of three double cabins, with full beams midships located owners stateroom, VIP suite to fore, and double cabin with two singles in between. A single person crew cabin with shower head is located to aft. The main deck is a split level saloon, with a dining galley area on the raised part to fore. So far no lower helm choice is shown in the official web site, but if Marquis wants to attract buyers outside the American continent, they should make this as a choice to the buyer. Power is six engine choices from Volvo, Man and Cat, in direct line shaft propulsion. Standard engine is a Volvo 575hp and largest option is the Cat 865hp. After presenting the Granturismo series with 30, and 20 models in 2010, Salpa continues to extend this range with the introduction of the 40 and 24 additions. The 40 is the latest model to be added to the Granturismo series, and is now the flagship of this range featuring as the smaller 30 an interesting mix of walk around spaces, mixed up with those of a cruiser. Her interior offers in fact space for two cabins sleeping four, an L-shaped saloon settee which converted can sleep two more, shower head, and a small size galley. Outside the Salpa covered to half by the hardtop is all about spaces with a large L-shaped settee, center console seating three, and a well sized galley wet bar behind the helm. The Salpa is powered in three engine choices from Volvo 260 up to 300hp with a 265 Volkswagen in between. The hull shape is a deep Vee, derivation of a legendary Renato Sonny Levi design. Sheikh Hassan bin Jabor Al-Thani and Steve Curtis led home a Spirit of Qatar one-three in race 1 of the Pearl Qatar Grand Prix, ending a nine-year wait for Sheikh Hassan to break his jinx of not winning on home waters since taking his first podium in Doha back in 2004. Teammates Ali Al Neama and Matteo Nicolini made it a double podium celebration for the Doha based team, coming home in third place behind Team Abu Dhabi’s Rashed Al Tayer and Majed Al Mansoori. It was a day of high drama inside the Pearl Qatar that started in the morning’s interrupted practice session, with Welmax crashing out and FA.RO ACIAI bursting into flames, side-lining both outfits for today’s race. The drama carried over into the race with Victory’s Arif Al Zafeen and Mohammed Al Marri penalised a total of four penalty laps. The parade lap saw Poliform immediately in trouble and limping back to the pits on one engine as the six remaining boats headed out for the start to run a revised circuit after race organisers reduced the lap distance to 6.63Nm. The Spirit of Qatar 96 duo found themselves trailing in second place after the start as Victory’s Al Zafeen and Al Marri edged ahead on the run to the first turn mark to lead at the end of lap one. Spirit of Qatar 95 came through in third ahead of Team Abu Dhabi, Fendi Racing and Relekta, both Fendi Racing and Relekta’s race ending on lap 2. By lap 3 Victory had opened up a 12 second lead but were adjudged by race officials to have moved across on Spirit of Qatar 96 on the run to the first turn and handed a penalty lap. Team Abu Dhabi passed Spirit of Qatar 95 and up into third place. Victory’s penalty lap proved costly dropping them to fourth and last place, with Sheikh Hassan and Steve Curtis taking full advantage and surging into the lead. For defending World Champion Al Zafeen the day deteriorated into farce, missing a buoy on the penalty lap, only to be handed another and then missing the same buoy, ultimately collecting four penalty lap infringements and running out the race in fourth spot. Sheikh Hassan and Steve Curtis were able to maintain their pace out front and from lap four were never troubled, going on to complete the nine lap, 56.26Nm race in 31.53,37secs at an average speed of 198.40km/h. Team Abu Dhabi’s Rashed Al Tayer and Majed Al Mansoori continued the impressive form they have shown throughout the weekend and once they had passed Al Neama and Nicolini were able to take their second podium together since teaming-up in Class 1 in Norway last year. Despite a recurring electronic problem that kept cutting power to one engine, the Spirit of Qatar 95 duo were able to hang on to third spot for what Nicolini described as an ‘unexpected podium’. Race 2 of the Pearl Qatar Grand Prix takes place on Saturday, 17 March with Sheikh Hassan looking to make it an historic win-double. Victory’s Arif Al Zafeen and Mohammed Al Marri came from behind to win race 2 of the Pearl Qatar Grand Prix, taking their third win together from four starts since teaming-up in Dubai at the end of last season. Team Abu Dhabi’s Rashed Al Tayer and Majed Al Mansoori made it a one-two celebration for the United Arab Emirates taking their second podium of the Grand Prix weekend, with Thursday’s race winner’s Sheikh Hassan bin Jabor Al Thani and Steve Curtis completing the podium in Spirit of Qatar 96. Today’s result puts Victory and Spirit of Qatar 96 joint top of the Championship standings on 32 points, with Team Abu Dhabi two points adrift in third. But the Dubai duo did not have it all their own way and had to overturn a strong challenge after a breathtaking start to the race by Italian outfit Poliform. The drag race from the green flag saw pole-sitters Spirit of Qatar 96, Team Abu Dhabi and Victory 3, line a breast and just feet apart as they hurtled into the first turn. But it was Guido Cappellini and Class 1 debutant Gian Maria Gabbiani in Poliform, starting on the outside of the line of eight, who showed a blistering turn of speed to get out front and come across to lead at the end of lap 1. Cappellini and Gabbiani, who failed to make the start of race 1 and forced to sit out the next two practice sessions with a recurring engine problem, held off the challenge of Al Zafeen and Al Marri, edging out to a four second lead before a technical problem forced them to slow, conceding the lead and retiring from the race on lap 6. With Poliform out, Al Zafeen and Al Marri were able to control the race and extended their lead, going on to complete the 11 lap, 66.54Nm race in 39mins 13.68s to win by over 15 seconds. Behind the race leader’s, Team Abu Dhabi and the Spirit of Qatar boats raced line astern, neither making any inroads to the other, with Al Tayer and Al Mansoori able to maintain a comfortable 11 second gap over Spirit of Qatar 96. For Sheikh Hassan and Steve Curtis any hopes of completing the Doha double evaporated at the first turn, losing the advantage of being in pole position and dropping to fourth at the end of the first lap. Following their disqualification from race 1, teammates Ali Al Neama and Matteo Nicolini faced an uphill task, starting from seventh place on the start line, and were unable to make any inroads completing a frustrating weekend finishing in fourth. Fendi Racing’s team manager, Marco Bonomo, had said before the race that after all the hard work that the team had put in to repair the boat after Luca Fendi and Giovanni Carpitella’s brush with a sandbank earlier in the week, if they finished it would be like winning, the Italian duo coming home in fifth place to pick up seven valuable points. There was more frustration for Norwegian outfit Relekta who ended a disappointing start to their year with a second retirement for Ugur Isik and Christian Zaborowski – stopping on lap 4. Welmax duo of Paul Gaiser and Bjorge Jacobsen paid back their team’s efforts for repairing the boat after they crashed out in second practice by putting in a cameo role, taking to the water to complete a handful of laps. Canados presents its next upcoming late Spring launch showing the project of the 120. 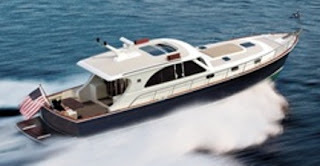 This new Canados will reach the larger size as presented by a wooden construction in the eighties, by the Rome Ostia sea side town located yacht builder. Designed by the Canados technical team outside and renowned architect Francesco Paszkowski inside, the 120 follows super structure lines as seen on the current flagship of the line the 116, which was presented as 110 in 2004. Fair to say it is indeed the evolution of the 116. The differences come in the inclusion of a hardtop, new side finger shape hull view windows, inclusion of opening two balconies per side on the main deck, and a C-shape settee to fore deck. Canados did not advise plan for inside which is pretty much custom in all its range, but the 116 has a choice of a four, or five double cabins layout with the owners stateroom usually located on the fore part of the main deck. 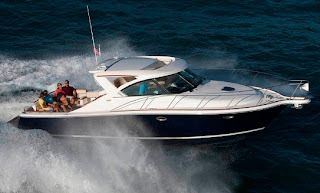 Power is from twin 2400hp MTU which should give a max speed of 29 knots. The Bering 55 is the first model of this fairly young US company, which today has a line up of seven more models, most of which are still in project stages. Measuring over sixteen meters the first Bering, this 55 gathered the attention of many yachtsman around the world for its heavy steel construction, which makes it a serious global passage maker even in this not so large size. Hull one of the Bering 55 featured a two cabins layout, with the space for the third cabin used as an office. In this layout the owners room is located to fore ship. The main deck offers a standard split level area with a welcoming relaxing lounging entrance, and a raised saloon area having more working areas; galley, pilot house, and a dinette. Standard power is from a single Cummins 285hp which gives a 9.8 knots max speed, and a cruise of 8 which delivers a 3000 nautical miles range. A supplemental emergency wing engine is available as optional. Presented in 1993, the Eastbay series has been a growing success for Grand Banks and today with this new upcoming 50 project the range features eight models from 39 to 55 feet. The Grand Banks 50 Eastbay will be the second in size of the range, and continues long standing traditions, as the Hunt designed hull or more recent additions as the use of ZF Zeus pods for propulsion. New more aggressive styling has been used on the 50, to make it standout as the latest model of the Eastbay series. SX will stand for the hardtop version, but an FB flybridge version is also available for those who like to helm in fresh air, and have an extra entertainment up top. PowerYacht will show this in few days time. The main deck will be divided by a patio door creating for a spacious area joining out doors with inside. Inside Grand Banks offers various options from two or three cabins below decks, to a mid level or upper main deck galley. Engine power and performance data is not so far given, minus that we know that ZF Zeus pods will be used as propulsion. Cigarette presents the inspired by AMG "Black Series" 50 Marauder, which takes the brand alliance started in 2009 a step further in this elegantly strong, automotive-influenced model. While AMG's Black Series tops its performance line, The Cigarette mirrors German company performance traits and takes its finishes to a new level of excellence. Because of its strong partnership and mutual high regard, AMG's magazine has labeled Cigarette as the Formula one on on water, the US boat builder is the only brand that has been given the right to use the valued logo on its product. The boat's striking black and white design scheme is carried throughout from the Mercedes color-matched paint to the all-newly designed interior, upholstered with luxurious Alcantara, an Italian imported composite suede-like material, that is durable and flame retardant; which is also used in Formula One race cars and high-end automobiles. Billet aluminum pieces over 100 are integrated throughout, customized for the AMG Black Series boat, incorporating a new formula of anodizing and corrosion resistance. Billet is featured on the dash, grab handles, seat supports, sound system and in numerous trim accents. The Cigarette 50 Marauder Black Series is powered by Mercury Racing 1350hp. Nine boats will line up in Doha for the Pearl Qatar Grand Prix, 14-17 March, the opening round of the 2012 UIM Class 1 World Powerboat Championship, marking the sport’s return to Doha for the first time since 2009 with the Qatar Marine Sports Federation (QMSF), the event organiser, moving the location from the relative shelter of Doha Bay to the more open water and hoped-for rougher conditions to be found off the Pearl of Qatar. 2012 sees the Championship start its 49th season since being recognised and sanctioned by the Union Internationale Motonautique (UIM), the world governing body for powerboating, and marks the 21st anniversary of the ‘modern era’ that saw the sport return to a multiple-venue World Championship in 1992. 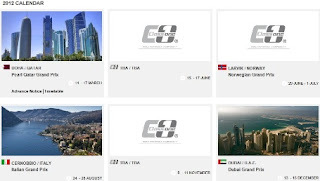 It is hard to predict who will win in Qatar, or titles in 2012, but based on the fact that Dubai’s Victory Team’s run of consecutive world crowns is running at five, and the impressive performances by Arif Al Zafeen and Mohammed Al Marri in the final two races of 2011 in Dubai to clinch the team’s eleventh World title, it will take a herculean effort by their challengers to break their vice-like grip on the Sam Griffith Trophy. With four-time World Champion, Nadir Bin Hendi ‘provisionally suspended’ by the UIM, Arif Al Zafeen will again partner Mohammed Al Marri – the duo boasting six World titles between them – and will start as favourites and the team to beat as Al Zafeen goes for his third straight win in Doha. If how to beat Victory is at the top of the teams’ ‘most wanted’ list, the on-going situation facing officials is the cry by some teams for greater parity between the screeching V12s and the thunderous V8s. In 2011 the mighty V12 was all-conquering, a quartet of outfits running V12s leading home a trio of those opting for the V8s in the title race, with the V8 runners managing just three podium appearances – one of those upgraded to a win courtesy of a Victory DQ. To ease the situation, officials have upped the rpm for the Mercury 850Sci V8 supercharged engines to 6350rpm from 6100rpm with modifications to the torque/power curve. Of the eight challengers who will line up against Victory, the most fancied challengers could be the two-boat assault of the silver-and-crimson-clad Spirit of Qatar Team. Their much-anticipated return to racing last year was a success, with Sheikh Hassan and Steve Curtis winning their first race together in Class 1 since teaming up in 2008 and taking the European title, whilst teammates Ali Al Neama and Matteo Nicolini took a win in Italy and the Edox Pole Position Championship – the team finishing second and third overall in the title race. The team and its current line-up has had mixed success in Doha since Qatar hosted its first Class 1 Grand Prix in 2002; Sheikh Hassan and Nicolini have enjoyed multiple podium finishes but a win has eluded both - the team’s only win on home waters was in 2006 courtesy of Abdullah Al Sulaiti and Lino di Biase - whilst Curtis, as a rival with Spirit of Norway, has won five times in Qatar. DAC Racing field a new line up in the V8 Mercury-powered Poliform with Guido Cappellini – now recovered from a broken ankle sustained in a road accident in Italy last month – joined by Class 1 debutant, Italian Gian Maria Gabbiani, moving over from four-wheel competition and up from endurance racing in the Italian powerboat championship. Cappellini’s credentials as a powerboat racer speak for themselves; he has won the F1H2O World title ten times, and since switching into Class 1 in 2010 has made the podium several times, and on his home waters of Lake Como at the Italian Grand Prix last year he grabbed his first win. Norway rolls out two teams; a last gasp reshuffle at Welmax Offshore Racing has reversed plans laid out in 2011 to run a two-boat line-up, which would have seen newcomer William Nocker teaming-up with 2008 European Champion Jorn Tandberg. Instead, the team has announced they will run one outfit in Qatar with Norwegian throttleman Bjorge Jackobsen joined in the cockpit of the Mercury V8-powered Maritimo-designed Welmax, by Brazilian Paul Gaiser – the duo mustering 23 starts collectively, with Gaiser taking his only podium in Abu Dhabi in 2010. Fellow Norwegian outfit, Zabo Racing, will be hoping to start their season where they left off in 2011, with Ugur Isik and race and pole position winner Christian Zaborowski producing a strong showing to put Relekta on the podium in Dubai. Fendi Racing will be looking to put behind them a frustrating 2011; a promising start with a podium was soon forgotten as their new Outerlimits hull-V8 engine package failed to deliver and they fared little better with the switch to SCAM V12s, and have confirmed a third switch of engines, opting to run Sterling V8s in 2012. Team owner-driver Luca Formilli Fendi will again partner the experienced stick-man Giovanni Carpitella, the pair grabbing two podiums from their ten starts together since forming up in 2010 - Carpitella taking his two Grand Prix wins in Uddevalla, Sweden. Team Abu Dhabi has confirmed driver Rashed Al Tayer and throttleman Majed Al Mansoori; the Emirati duo paired twice last year, teaming-up for the first time in the BMW Norwegian Grand Prix in Arendal and again at the end of the year in Dubai, grabbing their first podium together in race 2, with Team Abu Dhabi finishing fourth overall in the title race. Italian outfit Team D’Alessio-SCAM will be starting their first full season in Class 1 after joining the Championship midway through last year at the Italian Grand Prix. But with throttleman Luca Nicolini side-lined through injury, there is an eleventh hour call up for Norway’s Pal Virik Nilsen, with former F1H2O star Massimo Roggiero taking the wheel to make his Class 1 debut. Teams take to the water for the first of three official practice sessions on Wednesday, 14 March followed by official qualifying in the Edox Pole Position at 14:30hrs. Race 1 of the Pearl Qatar Grand Prix starts at 15:00hrs on Thursday with race 2 at 15:00hrs on Saturday, 17 March. Bavaria presents the new 39 Sport, which is more a revisit of the 38 model now incorporating sleek hull windows, new stern construction, and more luxurious options. These new changes of windows and stern give the new 39 Sport a more dynamic appearance on the water. In addition, new optional exclusive hull colour scheme and sporty design stripes are also available upon request to the 39 Sport. In the cockpit, folding bench seats provide generous amounts of additional storage. Below deck a two cabins sleeping four, a convertible saloon in two double berths, and galley are fitted in quality furnishings, equipment and veneers demonstrating the 39 Sport. This new 39 Sport also features a new optional full teak finish for the deck. The spacious salon is furnished in fine carpet. Also available is a full lighting package for the perfect ambiance both above and below deck and a high-quality Fusion sound system with performance speaker settings. Power choice is for five engines from standard twin Mercruiser gas petrol of 320hp, and Volvo diesels from 260 up to 370hp. The 120 SL is definitely one of the most awaited models in the Azimut fleet, and considering the success of the 2003 launched S fleet this had to be expected. 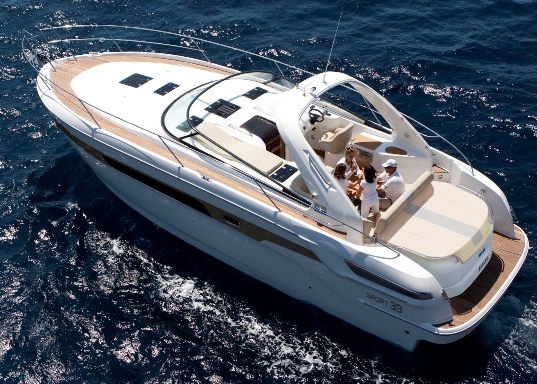 The sales numbers of the Azimut S has always been impressive; with the first model the 68 sold to over fifty units in less to a year at its time, and the second the 86 over ten in the same period. Designed as all Azimut fleet minus the Magellano range by Stefano Righini the 120 SL makes part of the Grande fleet, and is the current flagship of the Italian builders line up, although projects of a 126 tri-deck are in development stages. The new sports flagship of Azimut as the smaller 103 SL features a sport flybridge. Below in standard layout is space for four double guest cabins with an owners stateroom located to midships. An enclosed galley is located in between the cabins. Crew cabins are three sleeping from four to six located with a lobby to midships between the engine and owners room. Power is a triple MTU engine set up of 2434hp each with water jets propulsion giving a top speed of 36 knots. Hatteras presents the project of the new GT63 Enclosed Flybridge which features a spacious area in replacement to the open bridge, with an optional interior stairwell. The massive helm station has room for up to three main touch-screen monitors as well as ancillary controls and communication equipment, and an elevated L-shaped lounge provides a commanding view in any direction. Aft of the enclosure is secondary helm station and bench seating with additional storage. As on the standard model, the GT63 Enclosed Flybridge provides a great deal of comfort throughout, and does so without compromising on performance. Thanks to the upper Enclosed Flybridge, this GT63 should offer even more interior accommodation in the four cabins three heads, or three cabins three head layouts of the standard open bridge version. The Hatteras GT63 Enclosed Flybridge has a top end of 40 knots in a real-world environment when powered by twin CAT 1900hp.